Healthy Eating: Now you can option for healthier and tastier way of eating with the Takada Air Fryer ISB-AF11. Enjoy all your fried meals without oil (Oil-Free Cooking)! Sounds unbelievable right? Well, believe it! Now you and your family can eat delicious and without giving up your favourite fried meals! As more and more people now suffer from high cholesterol and other disease, now you can don't worry about the problems cook a fried meals still can saving your family stay healthy and prevent diseases that comes from oily food. This is your chance to not only enjoy a great meal, but also to show your love for them by saving them from future potential health problems. Time Saving: So how does an air fryer work? 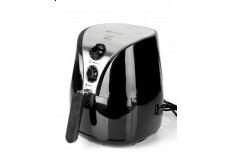 The Takada Air Fryer ISB-AF11 specifically gives off vapor stea..
Takada Electric Barbebue Grill For special occasions or just a casual family day out, bring out the electric barbebue grill and enjoy a specially cooked menus with the Takada ISB-6038A. 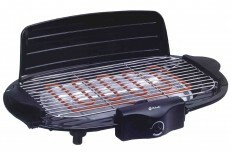 It is a convenient way to enjoy BBQ outdoor and indoors, but doesn't require charcoal or fuel to cook. Functions and Advantages Takada ISB-6038A grills your foods faster, and exhumes lesser harmful chemicals in the air to avoid pollution. With an anti-smoke water tank, the Takada ISB-6038A reduces its smoke emission which makes it suitable for indoor grilling. You will also enjoy less fat and oil in your food, and with lower cholestrols too! Other Features The Takada ISB-6038A has a safety lock that ensures operation only when the element is placed correctly. 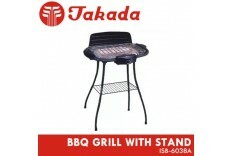 The temperature control..
Takada Electric Barbecue Grill For special occasions or just a casual family day out, bring out the electric barbecue grill and enjoy a specially cooked menus with the Takada ISB-6038B. This economical grill pan is a convenient way to enjoy BBQ outdoor and indoors, but doesn't require charcoal or fuel to cook. Grill On! The Takada ISB-6038B grills food faster with its high quality electric element, and exhumes lesser harmful chemicals in the air to avoid pollution. With an anti-smoke water tank, the Takada ISB-6038B reduces its smoke emission which in turn, produces less pollution and makes it suitable for indoor grilling. You will also enjoy less fat and oil in your food, and with lower cholestrols too! Safe & Easy The Takada ISB-6038B has a safety lock that do..
ISB-306 Introducing the useful and amazing kitchen helper, the Takada Deep Fryer Stainless Steel Isb-306. This product will give you the maximum value out of its extremely useful features. This product has an amazing futuristic design and it is made out of only the finest material to ensure top grade quality. This product is safe to use and providing high performance operation. Get it now while the stock last! 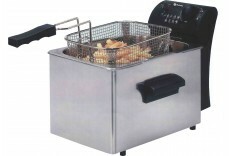 Features: 1) Stainless steel body - Continental design 2) Detachable oil tank for easy washing 3) Safe - Switches off automatically when overheated 4) 3.0L Large frying basket with insulating handle 5) Operating elements with LED display 6) Plastic lid with viewing window and permanent filtering of smell 7) Cold zone principle - No burning of food ..
Tk-DGP01 Live a healthier life starting with the Takada TK-DGP01 Double Grill Pan. The TK-DGP01 is the perfect solution to start cooking healthy and oil free food without having to give up on your favourite foods. 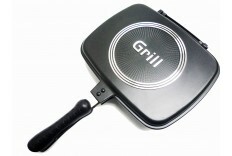 The TK-DGP01 is a versatile grill pan able to cook from vegetables, beef, chicken, fish and etc. Features The TK-DGP01 is specially designed to distribute heat and also to retain heat. The grill pan spreads heat evenly around the whole pan ensuring that your meat is cooked properly just the way you want it. The heat retention feature makes sure that heat does not escape and the correct amount is needed to help make your perfect grilled meal. The TK-DGP01 also has double layered inner ceramic coating which makes the grill pan non-stick and thus preven..
TK-DGP02 Introducing the useful and amazing kitchen helper, the Takada Double Grill Pan Black Tk-Dgp02. This product will give you the maximum value out of its extremely useful features. This product has an amazing futuristic design and it is made out of only the finest material to ensure top grade quality. This product is easy to use and it require less space for storage purposes. Get it now while the stock last! 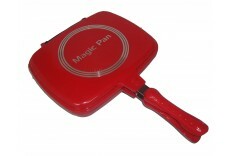 Features: Double sided grill pan Non-stick Inner ceramic coating Magnetic lock Size : 30 x 24 cm Color : BlackPan is specially made for best heat distribution and retention Non-stick and healthy double layered inner ceramic coating Magnetic locking mechanism and silicone ring allows flipping of pan to be used on Pan is ideal for grill and BBQ.. 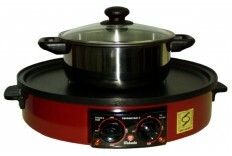 Attractive and Innovative Design The Takada TK-DP103 is great for cooking steamboat because the heating elements and controls for both steamboat and BBQ is separated so you can cook meals according to your need and preference. It's ideal for preparing big meals for lunch and dinner. So call your family, friends, relatives, colleagues and all your loved ones; enjoy an epic feast together as one! Versatile and Multi-Functional Apart from its multi-functional use, The Takada TK-DP103 emits minimal smoke and cooks your dinner fast by heating almost immediately and evenly. 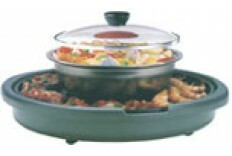 Your food will be cooked wholly without leaving any raw bits in the pot. It also has a thermal control and dual heating element, delicately cooking your food without sacrificing its natural taste and t..